I've already covered strategies for the civilizations that have been added or explicitly changed in the Brave New World expansion and its major fall (2013) patch. Now I'm going to move on to other legacy civilizations that have not had explicit changes, but who may have had their strategies significantly altered by the expansions and other updates. This time, I will be covering one civ that surprisingly does not benefit from Brave New World's new mechanics as much as one might think: the Roman Empire. Rome is one of the most influential and heavily romanticized cultures of the classical world. The early Roman republic was a system of semi-democratic representational government. Power was divided between two consuls who were annually elected by the citizens and alternated as military leaders to check each others' ambitions, while an appointed body of senators directed foreign policy and enacted laws. The city gradually expanded its power and influence in the second half of the first millennium BC through the overwhelming success of its legionary forces and defeat of its primary rival Carthage, until it eventually came to control almost the entire Mediterranean. Rome itself became the center of government and commerce for most of Europe, and it established an elaborate network of roads, aqueducts, and other engineering feats. The Roman government was generally very tolerant of foreign religions and cultures, which helped to pacify subjugated peoples. But as Rome became an empire, and its holdings expanded, this tolerance became a liability. Foreign peoples were allowed admittance into the army in order to secure Rome's ever-increasing borders, which lead to a decline in loyalty to Rome as the army became more diverse and less centralized. Eventually, generals would begin competing with each other for control of Rome and the title of emperor, weakening the empire from within and making it vulnerable to external threats such as immigrating Germanic tribes displaced by the Huns. Eventually, these threats would culminate in the sacking of Rome by the Visigothic leader Alaric in August of 410 AD, and the collapse of the Western Roman Empire. However, the eastern half of the empire, also known as the Byzantine Empire, would continue to carry the torch of Rome for another thousand years. After the death of Julius Caesar, his adopted nephew and heir, Gaius Octavius, along with Marc Antony and Marcus Lepidus, tracked down and defeated Brutus, Cassius, and the other assassins who had conspired against Caesar. This new triumvirate quickly disintigrated into civil war, with Octavius decisively defeating both Lepidus and then Antony and holding sole authority over a new Roman Empire. He changed his name to Caesar in honor of his adopted uncle, and reinstated the Roman senate as a puppet facade government to legitimize his dictatorial leadership. He was extremely popular among the Roman citizens due to his relation to Julius, and was eventually honored with the title Augustus. He instituted numerous domestic reform including official police and fire-fighting services, engineering projects such as roads, and expanded the dominion of Rome in Africa, Hispania, and Germania. Octavius found Rome a city of bricks; Augustus left it a city of marble, and the envy of the western world. I have not had a chance to play all the new civilizations in the Brave New World expansion. 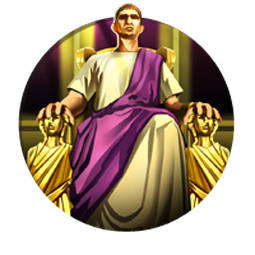 Each new civilization is pretty interesting though, as they all have very unique bonuses and utilize novel game mechanics. I am planning on writing a brief strategy post about each of the new civilizations as I play them, and I'm going to start with my favorite of the new civs (so far): Assyria. Assyria is one of the most powerful and feared civilizations of the ancient world. Their prowess on the battlefield and brutal treatment of subjugated foes made their armies so feared by rivals, that most opponents would seal themselves behind walls rather than face Assyrian armies in the open field. That is, if they didn't just surrender in exchange for leniency. Because of this, Assyria became masters of siege warfare and developed many novel tactics and inventions to assist in the storming of walls and breaking of gates. 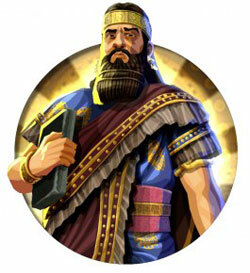 This prowess in siege is represented in Civilization V: Brave New World with both the presence of the Siege Tower unique unit, and the military experience boost given by the Royal Library unique building, as well the strong incentive that Assyrian players are given for capturing cities. Ashurbanipal was the last significant king of the Neo-Assyrian Empire. He ruled through most of the middle of the seventh century B.C.E. Although Ashurbanipal oversaw the beginning of the decline of the Assyrian Empire, he is best known for his legendary collection of cuneiform documents that were stored in his royal palace at Nineveh. It was brought to my attention that I had erroneously reported that Assyria could not steal technologies from City-States. This impression was based on an early attempt that I had made to capture a city state, but for which I did not receive a technology. I had assumed that City-States did not qualify because they do not progress through the technology tree in the same manner as normal civs (although they do generate science, their tech level seems to be based on the tech level of the most advanced normal civs that they have met). Upon further testing, I confirmed that Assyria can, in fact, steal techs from City-State. I have corrected the section about the Treasures of Nineveh ability, and have updated the strategy accordingly.